Contrary to an early notion, Apple managed to deliver more than a couple of surprises when it re-released iOS 5.0.1, which was specifically seeded for iPhone 4S users suffering battery issues. Although security holes have been scarce since the initial release of iOS 5.0 in mid-October, the fruit company managed to allow modders and developers some promise in their quest to port Siri through to devices aside from the company’s latest and greatest smartphone. As per MacRumors, it has now also been revealed that iOS 5.0.1 also fixes another less documented problem with the iPhone 4S – the "No SIM Card Installed" error. According to a new supporting document released by the Cupertino-based outfit, it has become clear that build 9A406 has been issued to users stuck with SIM card-related errors. It is thought, with the the issues affecting only a fraction of iPhone 4S users, Apple’s re-release would create a lot less fuss than declaring all with the next update, which is likely going to be iOS 5.1. 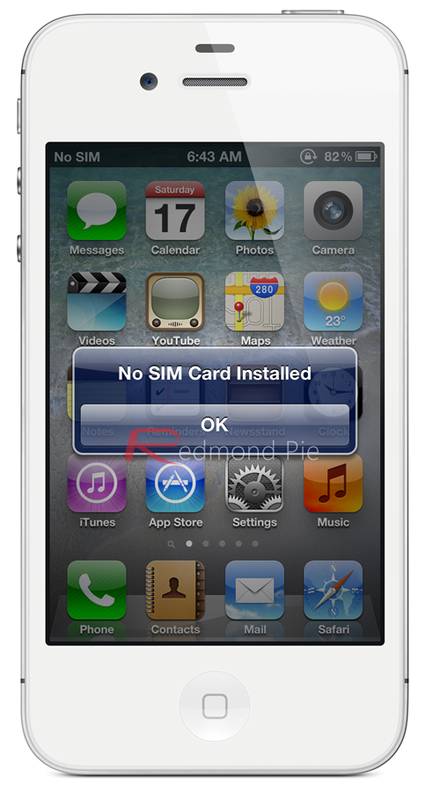 – "Invalid SIM" or "No SIM Card installed" alert appears intermittently. – Status bar displays "No Service" or "Searching" in a location with good network coverage. Apple goes on to describe the recommended solution for the issue, which involves backing up and then restoring the device, an action that involves iTunes pulling down the new Build 9A406 of iOS 5.0.1 and installing it on the user’s device. Once the device has been restored, the user can then restore their content and settings from the backup they made earlier. Unfortunately, user reports on the new build appear to be mixed, with some users reporting that it does indeed fix their "No SIM Card Installed" issues while others have seen no improvement. It is unclear at this time exactly why results are mixed and whether the fix addresses only some subset of the root causes of the issue or if some other factor is in play. Consequently, we may have to wait for more users to try applying the update before drawing more specific conclusions.